Whew! What a week it’s been. I just got back from the EuroSTAR conference in Stockholm and let me tell you, it’s been quite a ride. 4 days filled with non-stop tutorials, presentations, networking sessions, dinners, meeting old friends and new, learning cool stuff and a just an all-around smorgasbord of fun and learning. It was somehow both refreshing and tiring at the same time and left me with a lot to think about. In fact, this blog post itself is inspired by some of the thoughts that were triggered during the conference. EuroSTAR is the biggest testing conference in Europe and almost 1000 testers from around the globe participated this time. 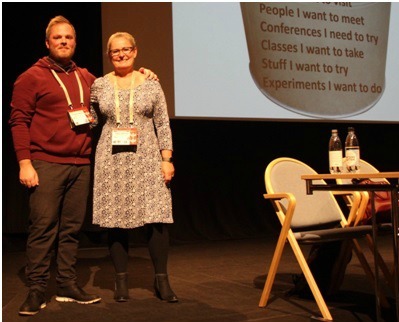 The theme was ‘learning to test, testing to learn’ and there were a number of inspirational talks around learning and development for software testing professionals. It was inspirational stuff and I even got to share the stage with my son and give a talk on two generations in software testing, the need for continuous learning and how the routes to learning have changed over time. All of this has got me thinking about the importance of continuous improvement for a software testing professional, or for that matter for anyone. Personally, I have always focused on continuously improving myself and this has considerably enriched both my personal as well as professional life. Apart from testing, I am interested in agile and process improvement as well as other non-work related hobbies, and all of these pursuits have added to my life in many ways. I strongly believe that such continuous training and development is also important for just about any individual. As a professional, we need to keep our skills sharp and not just look at our jobs as 9 to 5 endeavors but as important parts of our identity and life. In order to develop such pride in our craft and profession, we need to continuously learn and improve so that we can be on top of everything happening in our field. Another point is that we need to take responsibility for our own career and development. I cannot stress this point enough. Many people wait for their employer to assign training to them, and if they aren’t assigned anything they feel they feel like they have run out of options to learn and grow. However, as we shall see in my next blog post, this is a fallacy for there is a host of learning options available for software testers today. The point is that just like in any other fast-developing field, there is a constant need to retrain and keep learning if one is to remain on top of one’s game in software testing. And such training may not always be provided by your employer. So it is important for every individual to take responsibility for their own learning, be aware of their own training needs and to actively seek out knowledge that will help them flourish in their career. The profession of testing has evolved a lot over time. When I joined this profession back in 1995, I was the first person hired to focus on testing, and even the designation given to me was that of customer support. There was no such title as the software tester in my company! And I wasn’t alone. Many companies did not have a separate testing department and nor was testing recognized as a separate specialization back then. Today, however, the practice of testing has become a lot more professionalized and that, in itself necessitates a greater focus on training people. This becomes even more important when you add the increased complexity of the software being developed today. As the underlying technology changes, systems and applications are becoming more complex with every new release. If testers have to stay on top of their game, they need to be able to understand the underlying technology. The first system I tested was complex (A military command and control system), but was more or less isolated from the rest of the world. Today everything is connected, with IoT, robots and a strong online presence for many companies. These new technologies, together with the interconnectedness of everything have multiplied the complexity of projects today. All of this calls for a much higher level of expertise and knowledge on the part of the software tester. In addition, technology is constantly evolving. Hence, the need for continuous improvement. I started as part of a waterfall project. However, over the years as companies have adopted methodologies like DevOps and Agile and moved towards continuous delivery the importance of a professional approach to testing has increased as testing is a key component of being agile. These methodologies have also brought a lot of changes to the tester’s profile and the skill sets required of them. These are the three main reasons driving the need for continuous improvement and training among software testing professionals. This increased need is clearly reflected in the market for training programs. There is much more focused training available on specific topics than was the case earlier. The number of learning options has also exploded. Whereas earlier the focus was mostly on certifications and classroom training, today we have myriad options available to us such as online training, workshops, pair testing, conferences, and tutoring etc. So take responsibility for your own learning. Remember, it is your job, your career, your life and completely up to you to be proactive and get the most out of it. In the next blog post, I will dive into the different “flavors” of learning that are available today and how they can help our journey of continuous learning.